The new way to get ahead in America is to get a government job, Police, Judges, lawyers are often above the law and knowing this they commit crimes and take advantage of the public. It happens in a Child Protective Services and other government positions as well. Positions of lawlessness draw the worse people who prey on the weak and less fortunate. We’re seeing an alarming rate of innocent people who are found guilty by a fraudulent system who then spend decades in prison. What is worse is every it all costs the American tax payer money. We hire them, over pay them, they commit crimes, we pay them, the victim sues and we pay them. The American system is based on extorting billions of tax dollars from its people which government claims is for their own good. Yet government and those involved find ways to steal and rob those tax dollars. 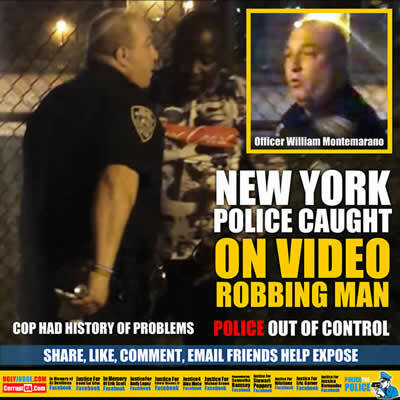 A Brookly New York Police Officer is caught red handed ripping $1300 in cash from the pockets of a man. You wonder why police speed when ever they want? Why they murder people for no reason? They know they’re above the law, have no one to answer to and worst of all if no video or audio evidence exists courts believe them over the public. Police and government steal, lie and cheat BECAUSE THEY CAN. Its that simple. Watch the video below, look at the photo above, note the officer is more interested looking away if anyone is watching as he is about to steal. Overpaid and under qualified, we hire criminals and then when exposed government does everything in their power to stop their removal.